Prehospital care is classified into ALS- (advanced life support) and BLS- (basic life support) levels according to the methods used. ALS-level prehospital care uses invasive methods, such as intravenous fluids, medications and intubation. However, the effectiveness of ALS care compared to BLS has been questionable. The aim of this systematic review is to compare the effectiveness of ALS- and BLS-level prehospital care. In a systematic review, articles where ALS-level prehospital care was compared to BLS-level or any other treatment were included. The outcome variables were mortality or patient's health-related quality of life or patient's capacity to perform daily activities. We identified 46 articles, mostly retrospective observational studies. The results on the effectiveness of ALS in unselected patient cohorts are contradictory. In cardiac arrest, early cardiopulmonary resuscitation and defibrillation are essential for survival, but prehospital ALS interventions have not improved survival. Prehospital thrombolytic treatment reduces mortality in patients having a myocardial infarction. The majority of research into trauma favours BLS in the case of penetrating trauma and also in cases of short distance to a hospital. In patients with severe head injuries, ALS provided by paramedics and intubation without anaesthesia can even be harmful. If the prehospital care is provided by an experienced physician and by a HEMS organisation (Helicopter Emergency Medical Service), ALS interventions may be beneficial for patients with multiple injuries and severe brain injuries. However, the results are contradictory. ALS seems to improve survival in patients with myocardial infarction and BLS seems to be the proper level of care for patients with penetrating injuries. Some studies indicate a beneficial effect of ALS among patients with blunt head injuries or multiple injuries. There is also some evidence in favour of ALS among patients with epileptic seizures as well as those with a respiratory distress. Prehospital care is an essential part of the treatment process in many acute diseases and trauma. Prehospital care is usually classified into ALS- (advanced life support) and BLS-(basic life support) treatment levels according to the methods used . ALS refers to sophisticated prehospital care using invasive methods, such as intravenous fluids, medications and intubation. The vehicle used in ALS has either been a ground ambulance (GA) or a helicopter. Basic Life Support (BLS) is medical care which is used to assure patient's vital functions until the patient has been transported to appropriate medical care. ALS-level prehospital care has usually been implemented by physicians or paramedics, while BLS-level care is given by paramedics or emergency medical technicians. However, in most cases ALS units use the same techniques as BLS units. While the concepts associated with ALS and BLS are diverse and differ between countries, both have developed towards greater sophistication. Some procedures that were previously classified as ALS-level prehospital care are now also available as part of BLS. In spite of active research, the effectiveness of ALS care compared to BLS has been questioned . Several research reports have been published, though no final conclusion has been drawn. Research projects have used different methods and target groups, and results have been controversial. The implementation of prehospital care is strongly dependent on local political, geographical, cultural and economic factors, making comparisons between systems difficult. The effectiveness of prehospital care also depends on the transportation method used and the emergency care given in the hospital. Thus, the problem of the effectiveness of ALS compared to BLS is only one link in the whole emergency care chain. stay and play: the patient is stabilized on site before transportation. While debate on the merits of these two strategies is still ongoing, their division has been criticized for oversimplifying the problems of emergency care. Moreover, the two strategies do not correspond exactly to the division between ALS and BLS prehospital treatments. In the United States, the scoop and run strategy has been favoured, whereas in Europe several emergency systems use a stay and play -approach. Researching and comparing studies in emergency care is difficult. Two main problems arise: Finding a suitable comparator across individual studies and also difficulties in comparing studies performed within different health care systems. ALS and BLS also entail different protocols in different countries. The need for ALS procedures is quite rare and mostly ALS and BLS units provide the same levels of care. The factors influencing emergency care are not constant; they may change rapidly. The whole treatment chain can be totally different at night compared to the daytime. The aim of this systematic review is to compare the effectiveness of ALS and BLS. The review covers all patient groups (e.g. trauma, cardiac disease, cardiac arrest, respiratory distress, convulsions) and all vehicles used for transportation of the team/patient (GA, helicopter, or both). The full report has been published in Finnish (available from: http://finohta.stakes.fi/EN/index.htm) . The literature search was conducted from the following databases: PubMed, preMEDLINE OVID Medline, CRD databases, Cochrane database of systematic reviews, EBM reviews, CINAHL. To explore the grey literature, we made a search from the Internet by using Google Scholar search engine. The review period covered the years 1995-2008. All languages were included. Combinations of the following search terms were used: advanced life support, basic life support, ALS (not amyotroph*), BLS, emergency medical services, emergency treatment, advanced cardiac life support, emergency, trauma, thrombolytic therapy, thromboly* fibrinoly*, prehospital, pre-hospital out-of-hospital (care or treatment or management or triage), paramedic, technician, ambulance*, helicopter, HEMS, mobile unit. 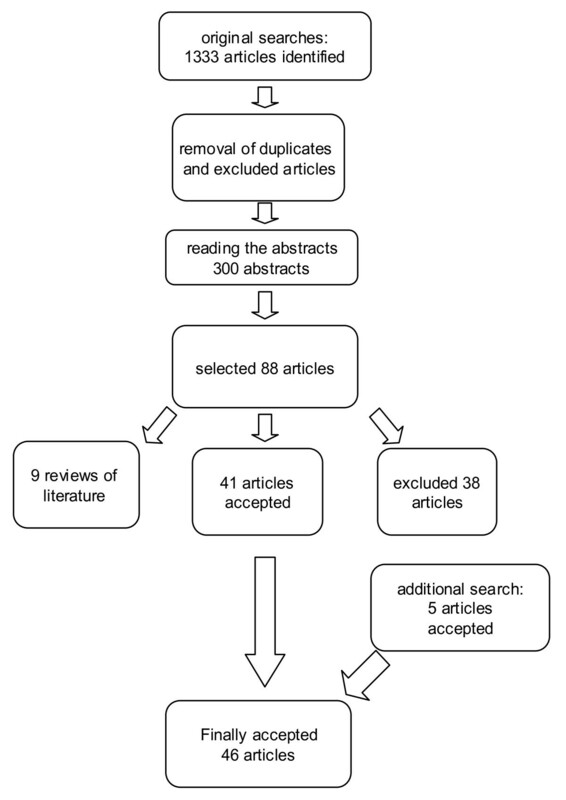 We performed a related articles - search from the PubMed for all articles we included after reading the abstracts. We also checked the reference lists from all relevant articles. The search process is presented in Figure 1. We also prepared a general overview of the previous reviews on the effectiveness of prehospital care and helicopter emergency services. The search strategy was the same as that used in the literature search for the systematic review. ALS prehospital care was compared to any other treatment (e.g. ALS care compared to patient transport by laypersons). A comparison between ALS and BLS was done virtually by an expert group. Patient's health-related quality of life or capacity to perform daily activities at follow-up. This systematic review is focused on patients' secondary survival. We accepted only the studies with a follow-up period until hospital discharge or later. We considered that studies using survival until arrival to the hospital are sensitive to the transport system and distance. We did not accept articles that only discussed treatment practices or treatment delays. Also we excluded articles using surrogate outcomes such as blood pressure or pain. Articles based on geographical epidemiology were also excluded. Studies concerning thrombolytic therapy were included if the thrombolysis was given by a prehospital emergency care unit (e.g. in an ambulance). Thus, studies in which the thrombolysis was performed by a general practitioner were excluded. BLS was defined as a prehospital emergency service using non-invasive life-saving procedures including cardiopulmonary resuscitation, bleeding control, splinting broken bones, artificial ventilation, basic airway management and administration of oral or rectal medications. Use of a semi-automatic defibrillator was considered to be a part of BLS. Some BLS systems are allowed to use adrenaline in resuscitation. They were accepted as BLS if they were referred as a BLS in the article. BLS is usually provided by emergency medical technicians (EMT) or other similarly trained professionals. ALS was defined as a prehospital emergency medical service using invasive life-saving procedures including all procedures of BLS but including advanced airway management, intravenous infusions and medications, synchronized cardioversion, cardiac monitoring, electrocardiogram interpretation and other procedures conventionally used at the hospital level. ALS is provided by physicians, paramedics or by other specially trained professionals. The following data were gathered from all the included articles: Bibliographical data (author, title, journal, year, volume, issue, pages), research aim, research methods (prospective, retrospective), years of gathering data, place of research (state or other), description of the research population, including patients' age and severity of disease (expressed as injury severity scale or other), professionals involved (physician, paramedic, EMT), transportation method, transportation time and distance, available and used treatments, treatment delays, baseline differences in the research population, mortality, health-related quality of life or capacity to perform daily activities, adjusted outcomes, transferability of research population and treatments across jurisdictions, amount of drop-outs and blinded measurement of outcome variables. Studies where ALS care was compared to cases where ALS care was requested but not obtained. Prospective studies using the TRISS-methodology or another comparable method to adjust the comparison between ALS and BLS or other control. Epidemiological studies with a follow-up of all emergency patients and comparison between ALS and BLS. Quasi-experimental studies with a comparison of ALS in one area with BLS in another area. Before and after -studies using ALS and BLS data gathered in the same area at a different time. Retrospective case-control studies using matched controls. Studies based on expert panels. The fulfilment of search criteria and the validity and methodological quality of all included studies were assessed by two independent researchers. In cases of controversy, a third researcher was consulted until a consensus was reached. Besides classification based on study design the following quality assessments of each individual study were made: unselected patients recruited, baseline differences, number of drop-outs described and blinded outcome assessment. We found 1333 references from the databases. In additional searches, five articles were identified. Two researchers read the abstracts independently as well as identified the original articles. Altogether, 46 articles were included. Additionally, we identified eight previous meta-analyses or reviews [1, 5–11]. The search process is presented in Figure 1. A summary of previous reviews is presented in Table 1 and original articles in Table 2[12–57]. Summary of findings in the previous reviews on effectiveness of advanced vs. basic life support. 1. medium quality 5 studies favouring ALS, 1 study favouring BLS. In general the quality of studies was poor, many studies quite old, the follow-up periods starting even from 1930's. Studies of higher quality favouring BLS. HEMS better than ground transportation, mortality OR = 0,86, not statistically significant. 2. cardiac arrest: early resuscitation and defibrillation associated with better survival, no special effect of ALS detected. 3. Cardiac infarct: 1 study, no difference between ALS and BLS. 4. Disturbances of consciousness, 1 study, no difference between ALS and BLS. In general results favouring BLS. Review for paramedic-ALS only, physician-ALS excluded. Summary of findings in the articles presenting effectiveness of advanced vs. basic life support. research, author, country, publication year. the implementer of the care. multicentre study in 16 countries, PHT compared with thrombolysis in a hospital. ALS (immediate PTH) n = 2750. BLS (hospital throbolysis) n = 2719.
both groups treated by a physician. trend to favour PHT (ALS). declined level of (epilepsy, hypoglycaemia, stroke). adjusted RR 1.60 (P = .002). before-after-design, prehospital cardiac arrest before (Period I, retrospective) and after (Period II, prospective) reorganisation of the EMS system. no difference between groups in total mortality. dual response: both ALs and BLS in the scene. GA in all groups. Pitetti et al. 2001 Pennsylvania, U.S.A.
96% of PHT-patients got treatment from"mobile intensive care unit"
adjustment: patients treated by ALS 2,4 fold probability to survive (p = 0,076). patients intubated by using medication showed better survival. no difference between ALS and BLS groups. compared to transportation by laymen. Only 72% of the patients were transferred directly to the trauma centers from the scene. Endotracheal intubation (7%), iv fluid (12%) and drug administration during the latter period. Implemantation of ALS did not decrease mortality or morbidity. In more severely injured patients (GCS < 9), mortality was lower in the BLS group. Abbreviations: ALS = advanced life support, BLS = basic life support, EMT = emergency medical technician, LOS = length of stay (in hospital), ISS = Injury severity scale/score, TRISS = Trauma Score - Injury Severity Score, HEMS = Helicopter emergency medical service, GA = ground ambulance. PHT = prehospital throbolysis, OR = odds ratio, RR = risk ratio, ALS-N = advanced life support - nurse, ISS = injury severity score. QoL = quality of life. Of the 46 studies there was one randomized controlled trial , 15 prospective follow-up studies [19, 20, 24, 30, 32, 37–39, 42, 45, 47, 50, 53, 55, 57] while the rest had a retrospective design. In the randomised trial  the effectiveness of prehospital thrombolysis and in-hospital thrombolysis for acute myocardial infarction was compared. Only two of the prospective studies reported an acceptable follow-up of patients [38, 47]. Five of the included studies [23, 31, 34, 36, 45] made no distinction between surgical, internal or other patients. None of those articles were considered to be of high quality. The reported result was the same in three articles [23, 36, 45]: No difference between ALS and BLS was found. Two articles [31, 34] used a specialist group to assess the effectiveness of ALS without comparison to BLS. Two studies concerning thrombolytic treatment of cardiac infarction were published in 1995 [12, 13] with three further articles on the topic published some ten years later [40, 46, 49]. In the two studies of 1995, patients having thrombolytic treatment showed a trend to better survival than patients having thrombolysis given in a hospital, but the result was not statistically significant. In the three studies from 2004-2005, prehospital thrombolytic treatment was more effective than hospital thrombolysis, but only in Björklund's study  the result was statistically significant. The validity and generalisability of the studies were considered good. We found eleven articles that dealt with penetrating or unselected trauma [16, 19, 21, 22, 25, 27, 39, 43, 50, 56, 57]. One included study  focused exclusively on penetrating trauma. Eight included studies considered both penetrating and blunt traumas, two of which [43, 57] presented results separately for each type of injury. No difference between ALS and BLS was found in five of these studies [19, 21, 25, 50, 57], though injuries in those studies were relatively mild (ISS over 15 in 11-15% of patients). Five of the studies showed better results for BLS [16, 22, 27, 39, 56]. In studies by Seamon  and Demetriades et al. , ALS treatment of trauma was compared with transportation to hospital by laymen. In both studies, transportation by a layperson showed better survival rates than ALS. Three studies [22, 27, 39] showed better survival in BLS patients as well as the study by Stiell et al  among subgroup of patients with GCS < 9. In the study by Frankema et al. blunt trauma patients having ALS treatment given by a physician and transported by a helicopter showed better survival than BLS-treated patients transported by a GA. In general, there is no evidence that ALS would be superior compared to BLS in penetrating or unselected traumas. There is one study supporting ALS by Frankema et al. but the result was confounded by the transportation method. Six studies concentrated in blunt head injury [24, 29, 30, 38, 44, 48]. In three studies the combination of ALS treatment and helicopter transportation gave better results than BLS with a GA [24, 29, 48]. In two studies [38, 44] intubation without medication by a paramedic was harmful compared to intubation in a hospital by a physician using medication to assist intubation. In the study by Di Bartolomeo , there was no difference between ALS and BLS. Eight studies concerned patients with multiple blunt injuries [33, 35, 37, 41, 47, 51, 52, 57]. No clear difference between ALS and BLS was found [47, 51, 52, 57]. Two studies showed better results for BLS [33, 35]. Results were difficult to estimate, because the comparison between ALS and BLS was confounded by transportation (helicopter or GA) and treatment level of the hospital . The effect of prehospital treatment for patients having respiratory distress was studied in two papers [32, 53], both of them favouring ALS. One study was focused on epileptic patients  and one study on all unconscious patients (epilepsy, hypoglycaemia or stroke) . In epileptic emergencies, the results favour ALS , and in the other study no difference was detected . Hardly any research exists on several patient groups needing emergency care (e.g. stroke, intoxication, drowning,). Both ALS and BLS have developed and some methods used formerly in ALS may later be included into BLS. Different studies use also different definitions of ALS and BLS. The inclusion and exclusion criteria of this study have been set according to one definition. If the definition is changed, the set of articles may also be different. The level of credibility of separate articles is always subjective, especially in articles with border-line credibility. In studies concerning unselected patient groups, the evidence does not support ALS. Similarly, in studies of all injuries, ALS has not been found to be superior compared to BLS. ALS treatment by a paramedic can even be harmful compared to BLS. When the patient material has concentrated to more serious cases, blunt head injuries or multiple injuries, some studies have demonstrated a beneficial effect of ALS. However, not all studies confirm this. ALS seems to be most beneficial when having an experienced physician in the staff. The critical limit of the experience of the staff can be defined as the ability to perform an intubation by using hypnotics and muscle relaxants. If this limit has not been reached, an ALS activity can be harmful. We did not find evidence supporting ALS in regard to cardiac arrest if use of a defibrillator is included into BLS. In cardiac arrest, early cardiopulmonary resuscitation (CPR) and defibrillation are essential for a patient's survival. For instance in Finland, even lay rescuers are trained to use an automated external defibrillator and start CPR. No evidence has been found on the effectiveness of other activities in treating sudden cardiac arrest when the end point of the studies has been secondary survival (at discharge from hospital). The most promising intervention - prehospitally initiated therapeutic hypothermia - still needs more validation. Prehospital thrombolysis seems to be superior to thrombolysis given in a hospital, but it should be remembered that prehospital thrombolysis is only one link in the treatment chain. We have not assessed the effect of other treatments for acute myocardial infarction. We interpret the contradictory findings between studies as due mainly to the multitude of definitions for ALS and BLS, differences in treatment populations and interventions, the high risk of bias in the original studies, and lack of statistical power: cases where ALS is beneficial may be too rare to be identified by statistical methods in an unselected material. There is a clear need for international definitions of ALS and BLS, appropriate documentation of populations and performed interventions in trials, and more high quality studies taking into account different patient groups. Among defined patients, e.g. those having brain injuries, the benefit of ALS can be found if there are enough eligible patients. The infrequency of potential cases for ALS indicates that an ALS emergency system requires a large enough catchment area. Only a very few studies analyzing prehospital care of trauma described the severity of trauma and the interventions performed. The control groups were usually not comparable to the index group: the ALS groups tend to consist of more severely injured patients. Additionally, common confounding factors include different transportation means (helicopter vs. ground ambulances) and the different levels of the admitting trauma hospitals. In many studies patients with only very mild injuries or, conversely, patients with little chance of survival (i.e. traumatic cardiac arrest or gunshot wounds to head) have been included. The majority of studies favour the use of a helicopter, but the results were contradictory. In many studies, the effectiveness of an operation model (ALS vs. BLS) was confounded by not being able to take into account the vehicle used (helicopter vs. ambulance). The effectiveness of a helicopter may warrant that it is used for all patient groups, and especially for patients where prehospital treatment is known to be effective (e.g. myocardial infarction). Among trauma patients, the best results are probably achieved when the severity of the trauma can be classified as being moderate or serious but not indicating a poor prognosis. A helicopter service requires a sufficiently large catchment population. The distance from the site to the hospital mediates the effectiveness of ALS. For short distances (urban and semi-urban areas), there is no evidence favouring ALS in the case of an injury. According to Nicholl et all  a 10-km increase in distance from a hospital is associated with a 1% absolute increase in mortality. For longer distance, ALS operating with a helicopter seems to be effective, but still there is a contradiction in terms of cost-effectiveness: longer distances are associated with a more sparse population. In a British study concerning trauma patients only , the population base was estimated to be 3 million. In Finland, injuries make only about 20% of all cases in a typical Finnish Helicopter Emergency Medical Service. Thus the estimation by Nicholl is in line with a Finnish practical experience that a population of 0.5 million to be reached in 30 minutes may be satisfactory for a helicopter-ALS -service. While the concepts "scoop and run" or "stay and play" are often present in the literature, they reflect the tactics of emergency services, and should not be seen to correlate directly with ALS or BLS. An ALS-level emergency unit employs rapid assessment and scoop and run -tactics when a definitive treatment outside the hospital is not possible. A penetrating injury with bleeding is an example of a situation where immediate surgical treatment is imperative. When a diagnosis is feasible and definitive, an effective treatment can be started prehospital by using stay and play -tactics, for example, prehospital thrombolysis in a myocardial infarct and early defibrillation in a cardiac arrest. The tactic of choice is determined by the nature of the emergency, the available services, and the possibilities for starting the treatment in the hospital. All hospitals can not give all treatments at all times of the day. Treatment delays are caused not only by distances but also by the care level of the hospital. The right to emergency health care services in many countries (including Finland) is granted to citizens by a legal constitution. Equal access to effective treatment is also one of the fundamental principles of health care in many countries. How to organize an emergency service is affected by medical knowledge but also by general opinion, people's sense of safety and earlier structures of services. It may be reasonable to organize ALS-level emergency services even when there is uncertainty about the cost-effectiveness of such services. An ALS system operating with a helicopter can also bring services to sparsely populated areas. The overall quality of the analyzed studies was poor. Among 1333 studies, only one randomised controlled trial was found. Thus, no conclusions on the effectiveness of advanced prehospital care in unselected patient cohorts can be drawn. In the prehospital care of sudden cardiac arrest early defibrillation and cardiopulmonary resuscitation are still essential; further ALS interventions have not been able to demonstrate increased survival. Prehospitally initiated hypothermia is a promising treatment but is not as yet an evidence-based intervention. Prehospitally initiated thrombolysis of myocardial infarction improves survival when compared with in-hospital initiation of thrombolytic treatment. There is evidence that ALS is beneficial in epileptic patients and among those with respiratory distress. Due to multiple methodological problems found in trauma studies, the comparison of ALS and BLS prehospital care is difficult and, in unselected trauma cohorts, impossible. It seems obvious that in urban settings and in patients with penetrating injuries, ALS does not improve survival. In some patients, for instance, patients with severe head injuries, ALS provided by paramedics and intubation without anaesthesia can even be harmful due to uncontrolled intracranial pressure. If the prehospital care is provided by an experienced physician and by a HEMS organisation (Helicopter Emergency Medical Service), ALS interventions may be beneficial for patients with multiple blunt injuries. In many patient groups such as patients with cerebrovascular problems, intoxication, drowning etc. there is very little research available on the effectiveness of ALS and BLS levels of prehospital care and thus no conclusions can be made. The need for high quality controlled clinical studies is obvious. Besides that, the development of prehospital care requires uniform and full documentation and follow-up of patients as well as register studies based on real-life data. The authors thank Riitta Grahn and Jaana Isojärvi from the library of The National Institute for Health and Welfare (former STAKES) for completing searches. Professor Marjukka Mäkelä has given important advice in planning the study. JR is a doctor-in-charge of MediHeli helicopter emergency medical service, Helsinki, Finland. TI is a clinician of MediHeli 02, Turku, Finland. Other authors declare that they have no competing interests. OPR, TI, JR, HP and AM all have been participating in the study design and planning the search strategy. OPR, TI, JR and AM assessed the articles and made the data extraction. The manuscript was completed by OPR, TI and JR, assisted by AM. All authors have read and approved the final manuscript.